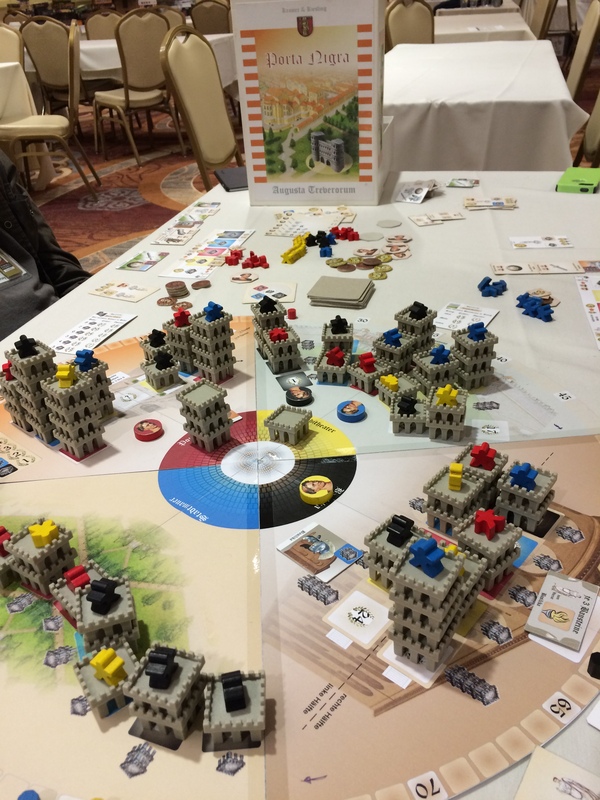 My last post detailed all the games that Sen and I pitched to the various publishers that were at the Gathering, but this post will be all about the games I played – in no particular order! Thunderbirds by Matt Leacock: I really liked this game! I have no familiarity with the TV show, so I’m happy to say that this game is still entertaining without that background of knowledge. We played it without any of the expansions and we barely won. I like how players control characters, and while each character has their own mode of transportation, any character can take any vehicle – and can even take other characters with them. It’s an interesting idea that really makes it feel like we are all a team and we have to work together. Then a few days later we played it again but with the Purple Hood expansion – and I have to say that I liked it even more. 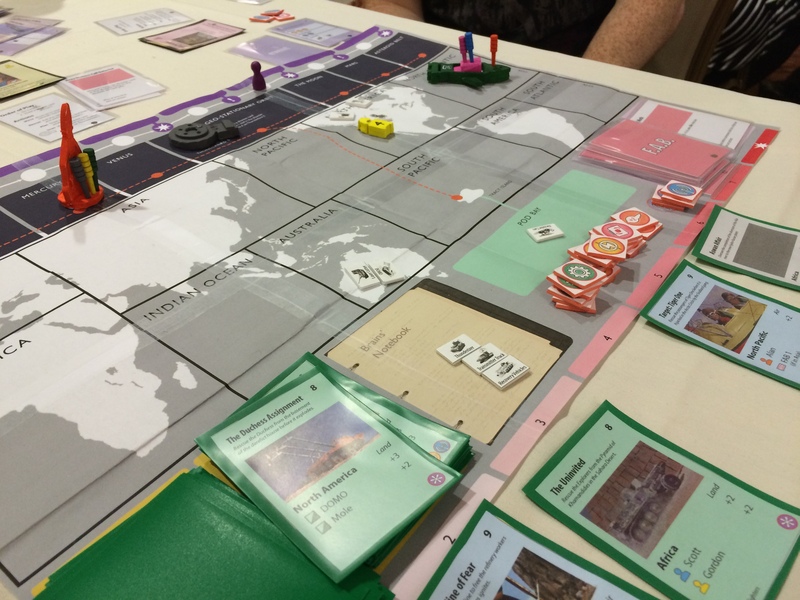 Now the bad guy isn’t controlled by AI – but by one of the players. That player is trying to accomplish his goals while trying to make it difficult for the rest of us. This was really fun and it really felt like there was a narrative to the game we played. There are even two more expansions that we didn’t get to try! Wow! Looking forward to this one. 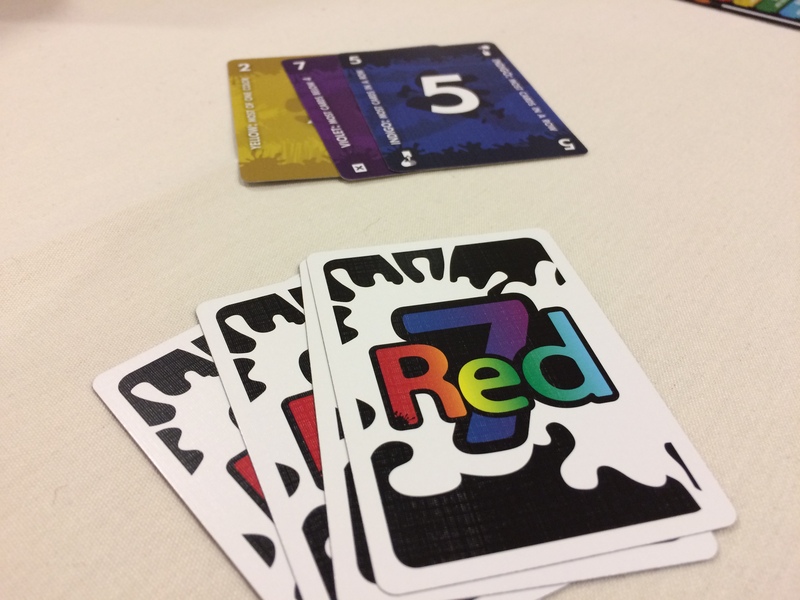 Red7 by Carl Chudyk and Chris Cieslik: This was a fun game that I ended up playing a few times over the week. It’s a simple idea where you have to be winning the game when you’re turn is over – or you lose and are out. So you can either play a card in front of you, or change the rule of how you win – or both. It’s fun and light and interesting! From the designer of Glory to Rome and the upcoming Mottanai. Ulm: I’m not sure who designed this one actually. 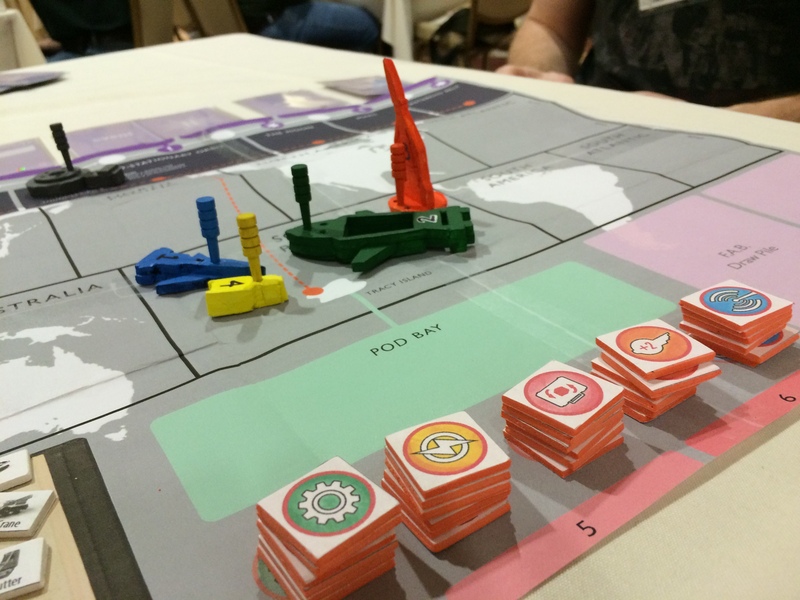 We played a prototype from Huch & Friends and this is one that will be coming out from them. I really enjoyed this game! It has an interesting action selection method where you slide a token into a 3×3 grid and the colours of the tokens in the row/column that you affected are the actions you can do this round. Really cool! Castaway Club by Vladimir Sluchy: This is the spiritual successor to Last Will. It uses the same icons as Last Will and has a similar theme. Instead of trying to go broke, you’re trying to lose reputation. 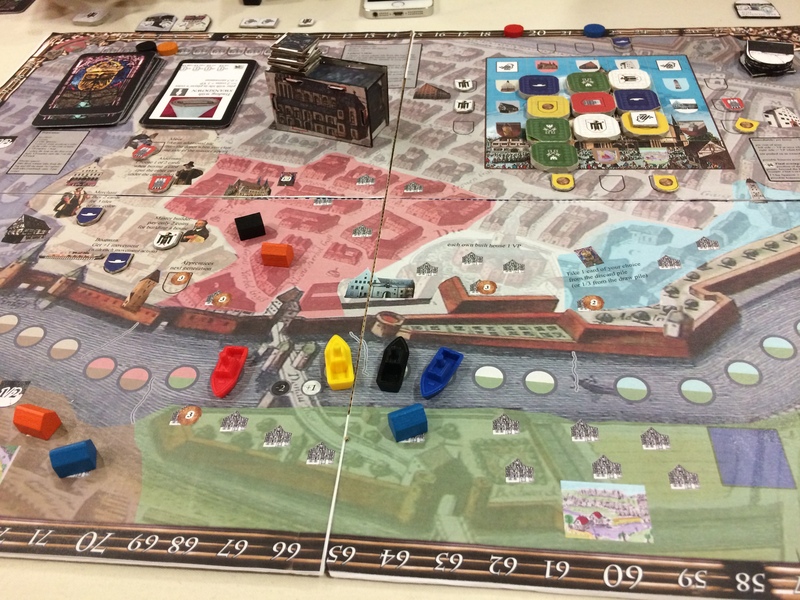 The game comes with three modular boards and you can use any two of them – or you can swap in the entire game of Last Will as one of the modules! Cool! I had fun with the game and fans of Last Will should check it out. 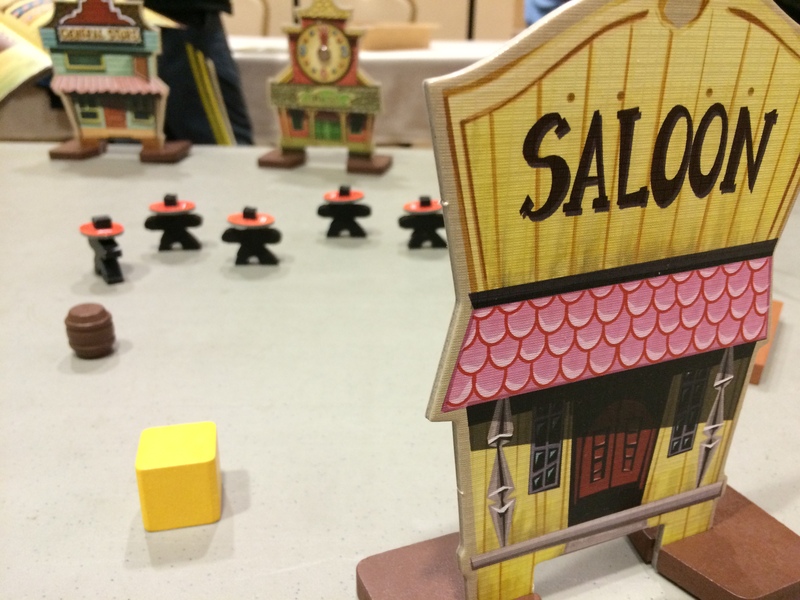 Flick ‘Em Up by Gaeton Beaujannot and Jean Yves Monpertuis: What a fun concept for a game! 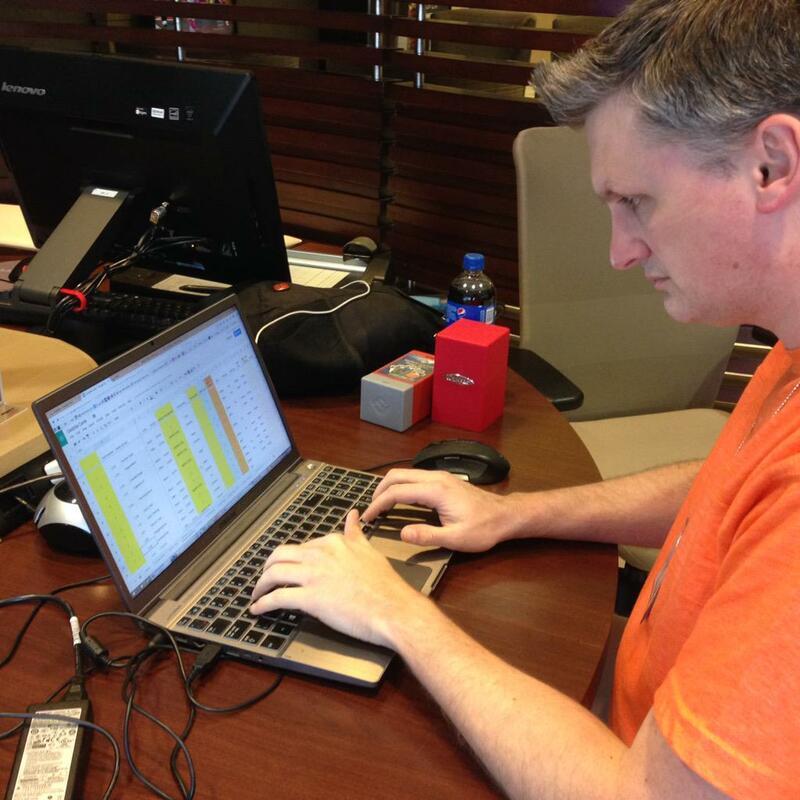 It’s a flicking game – but players play in teams – good guys or the bad guys. Players move their wooden figures around by replacing the wooden figure with a disc, flicking it and then replacing the disc with the wooden figure. Or a figure can shoot by placing a smaller disc at the side of a wooden figure and flicking it towards an opponent. What’s really cool is the production quality! Holy crap – it’s amazing! Every game will be photo worthy for sure! Also interesting is the fact that the game comes with 10 scenarios. So replay value is very high! If you like flicking games, then you have to get this one! 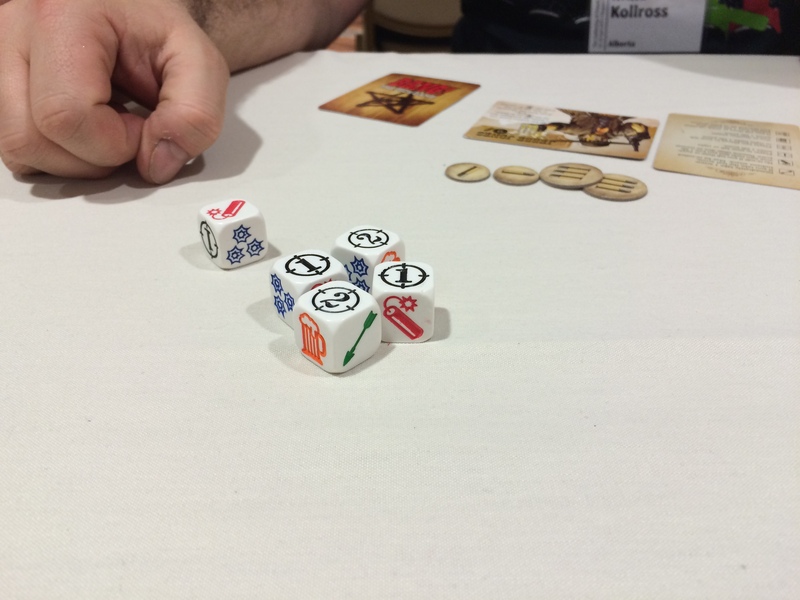 Bang The Dice Game by Michael Palm and Lukas Zach: I was never a huge fan of Bang – but the dice game is more accessible and more fun. I enjoyed it! Unannounced Matt Leacock party game – Can’t talk about it but it’s such a great idea! This will definitely get picked up. 7 Wonders: The Duel by Antoine Bauza and Bruno Cathala: I am a fan of 7 Wonders and this 2-player only, stand-alone game is a great game! It really has all the feeling and concepts of a 7 Wonders game but offers new strategies with the pyramidal stacking of the cards. The game can end immediately if a player gets their token to the end of the war track or if they get one of each of the 6 science symbols – so that keeps your opponent on their toes and altering their strategies along the way. I’ll be picking this up! 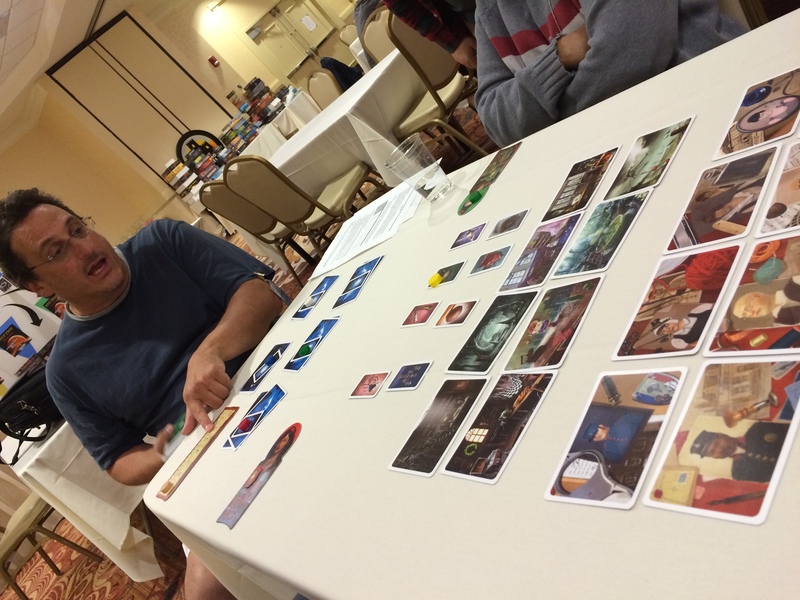 Codenames by Vlaada Chvatil: It’s not announced or even picked up yet so I can’t show pictures but this seemed like the hit of the Gathering. There was always someone playing this game! It’s a small word/party type game that is great for thinky people! Birth by Takashi Sakaue: A cool Japanese dice rolling and moving around a circle game that has more to it than you might think. Clever game that I’d play again. 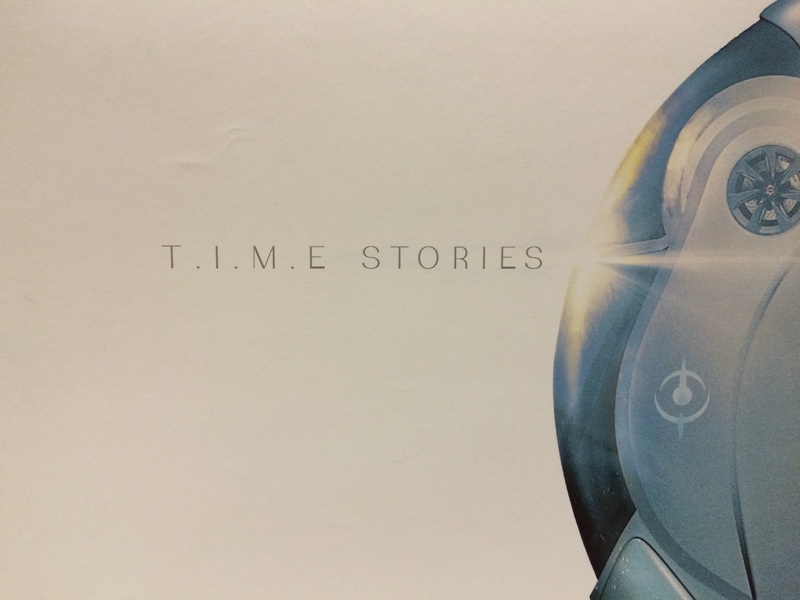 Time Stories by Manuel Rozoy: I know there are a lot of people that are super excited about this game, but it fell a bit flat for us. The concept is interesting but the execution left us lukewarm. When we had to go back through a third time, you could tell that everyone was a bit exhausted and didn’t want to go through the paces of the stories to get to where we had to go. The storyline of the game we had to play was lacklustre and I think I would have been more into it if the story was more intriguing. Maybe this is a game that would appeal to role playing gamers more?? 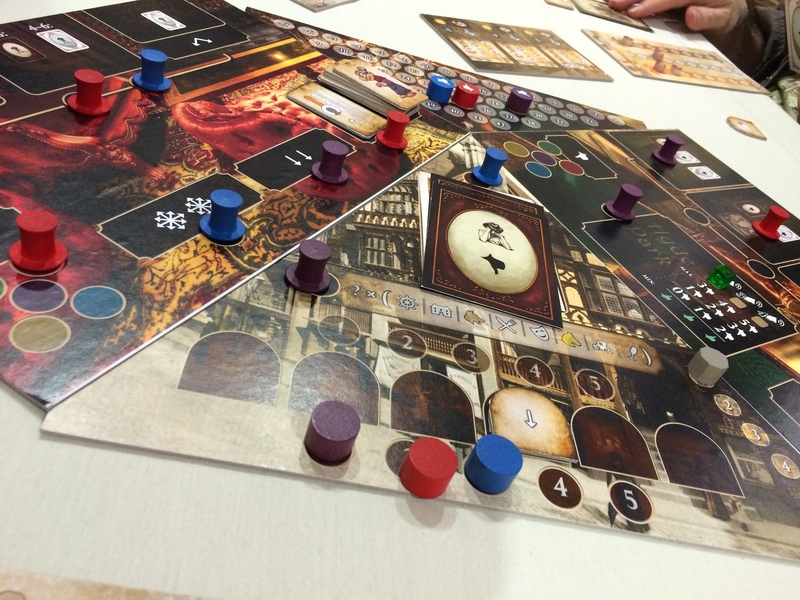 Mysterium by Oleksandr Nevskiy and Oleg Sidorenko: Finally I got to play this game – and I really liked it! One player plays a ghost and has to let each of us know who killed him by giving us dream cards that will remind players of Dixit. In fact I saw people playing the game with Dixit cards! This is a great party game as everyone is involved and engaged (though the ghost player can’t really chat with others). Really fun game! Beasty Bar by Stefan Klob: A fun game that harkens back to Guillotine where you play animal cards in an attempt to get into a club. It’s fun and a bit chaotic. More plays of this would help me know if familiarity increases skill or not! 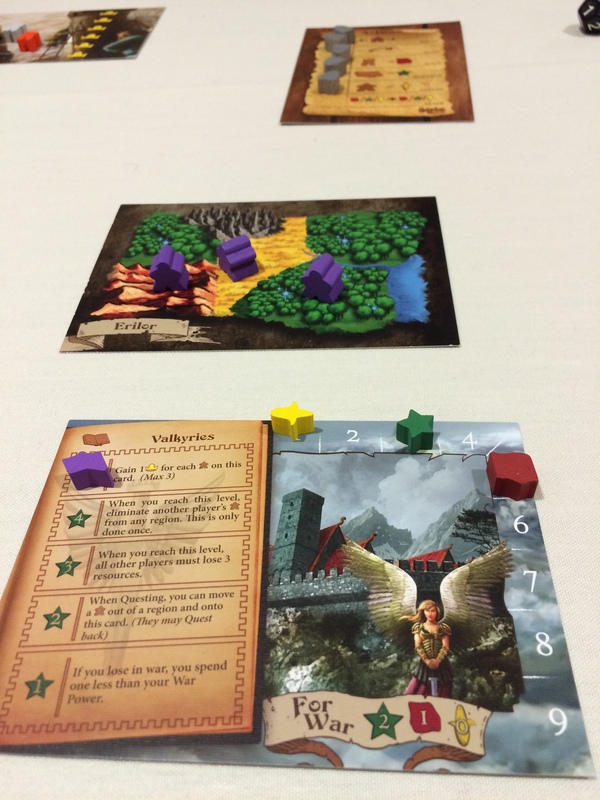 Welcome to the Dungeon by Masato Uesugi: This is a great little mini game that has a fun push your luck element to it. We had a lot of loud outbursts throughout the game as players would push their luck and then win! 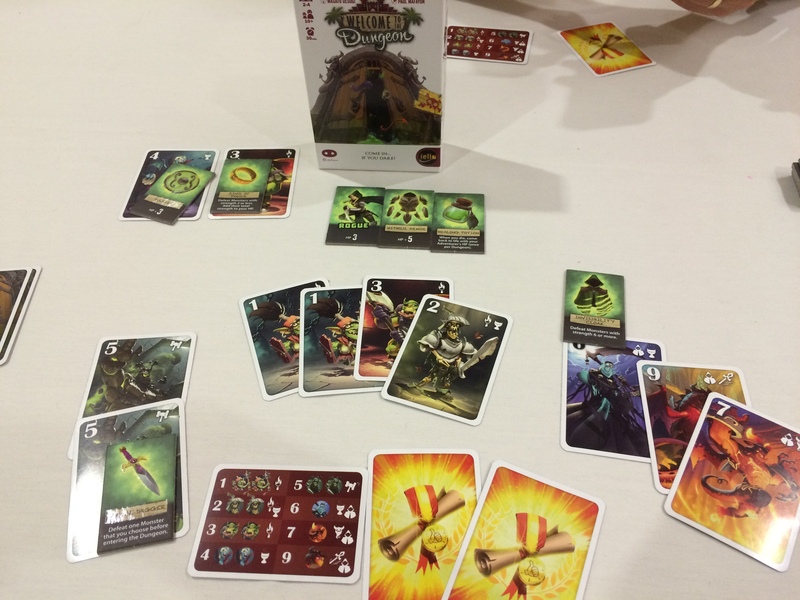 Players simply take a card from the deck and decide to either place it face down in the dungeon or face up outside the dungeon but then remove one of the artifacts or weapons that the character can use to battle these monsters. Eventually players start to pass instead of taking a card – and the last player in must then go through all the cards in the dungeon with the equipment that he or she has left. Very fun – and it comes with four totally different characters with their own equipment. 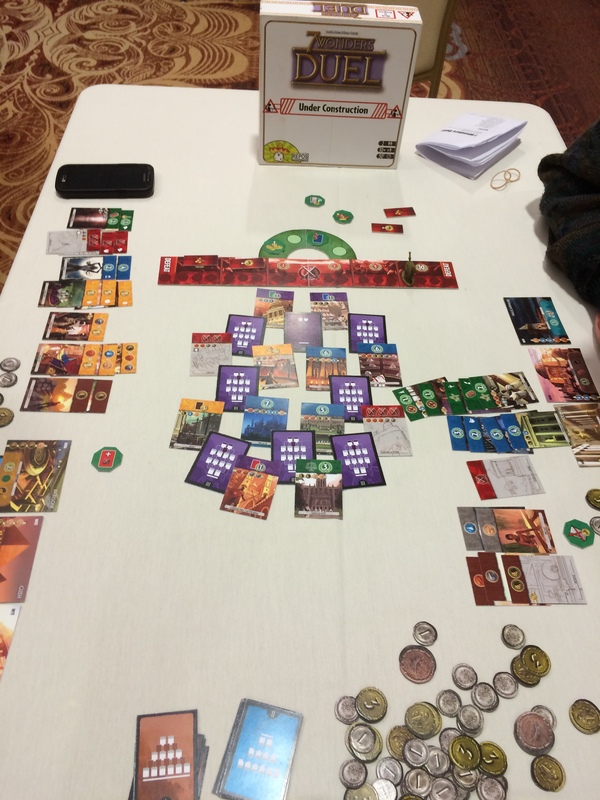 Porta Nigra by Wolfgang Kramer and Michael Kiesling: I’m a big K&K fan so I’ll play anything they make. Unfortunately this one was a bit too abstract for me. I prefer their games that have some theme to it. 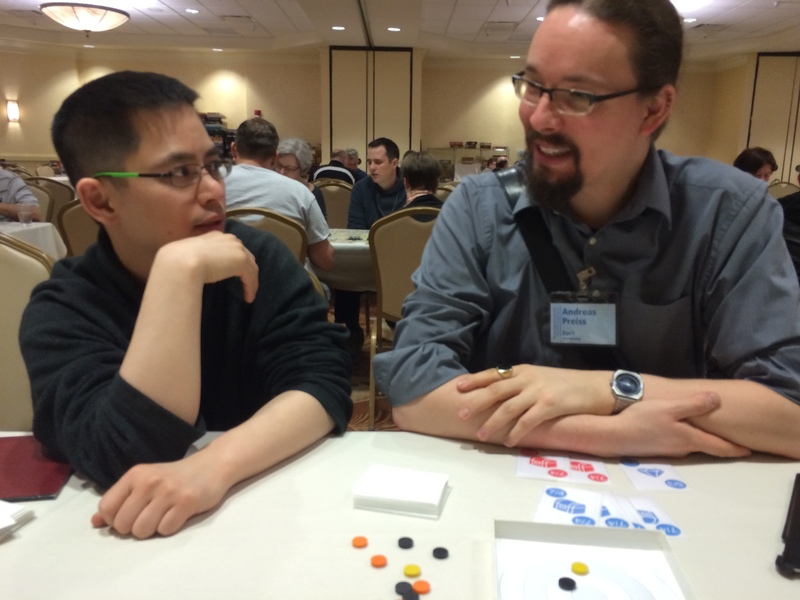 The theme in this game could have been anything really – and so it becomes a mathy game of efficiency. And that is fun and interesting, but it’s a bit cold for my tastes. Other people claimed it their favourite game of the Gathering! That’s about it. 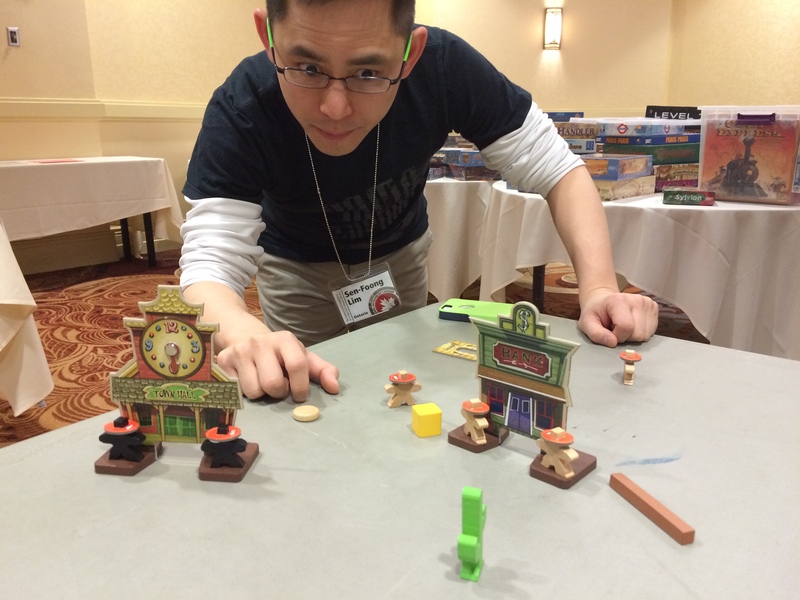 I did play some more prototypes of games that aren’t signed yet by some Game Artisans of Canada as well. All in all – a super fun week and I’m already counting down the days for next year’s Gathering! 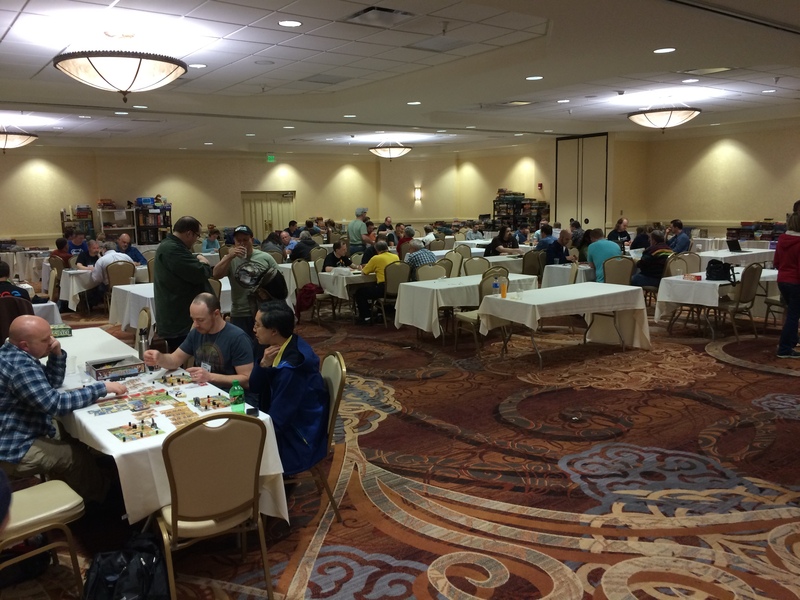 Akrotiri makes Rahdo’s Top Ten games of 2014! Rahdo has posted his updated Top Ten list of games of 2014 and Akrotiri has squeaked in at number 10! He created his list at the end of December last year but since so many games come out around that time, it’s taken him a few more months to try all the other games and he has now updated his list. 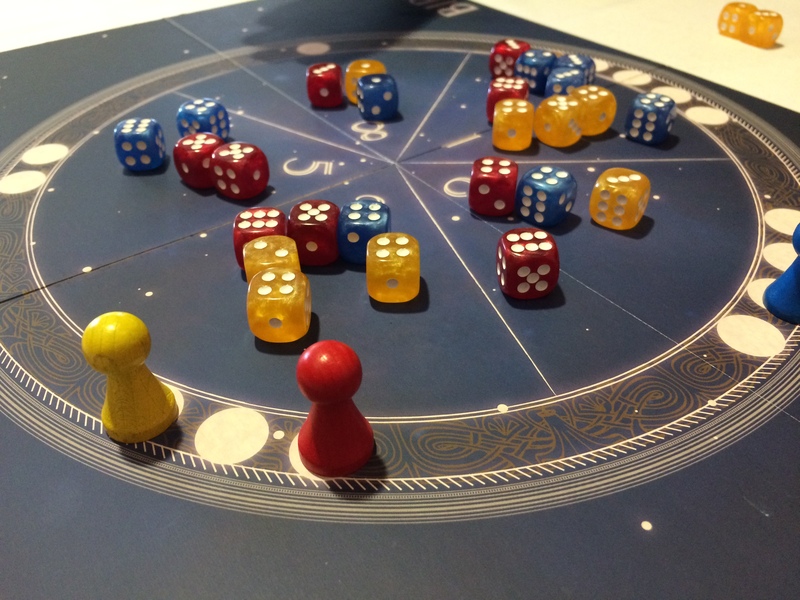 Two games got bumped off the list and two games got added – Akrotiri at number 10 and Roll for the Galaxy at number 2. Very happy to see that he’s digging our game! Thanks for playing Rahdo!